Update: GameStop now has a page on their website for it. Pre-orders seem to be live, as well. I guess it’s using the same Engine as Wolfenstein II, so it’s probably a lot easier to port it this time around. Fingers crossed for Doom Eternal! I’m crossing all my fingers and toes for that. If it’s partial digital and partial physical retail version then I’m not buying it. It makes no damn sense for these retarded companies to release game half physically and force you to download the rest! Either make it fully physical or don’t release a physical version at all! Of course it makes sense, the download size is smaller and therefore you can save space on your storage (and possibly avoid buying SD card, e.g. in case of LA Noire). It makes complete sense. 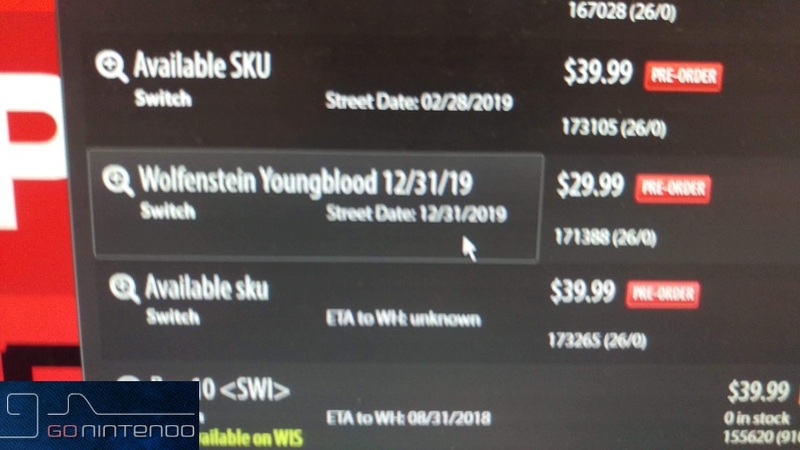 On the PC, Wolfenstein 2 needs 55gb. The max game cart size that a developer can use for the Switch is currently 32gb. Nintendo delayed the 64gb carts until 2019. If you want this game on the Switch, there is literally no other option and it’s not Bethesda’s fault in any way. If anything, good for them for shelling out the cash on each game to get the 32gb carts in order to minimize the amount you need to put on your own SD card. And no, it’s not them being lazy because “hey look Nintendo makes small file sizes.” Nintendo doesn’t use boatloads of dialogue or complex textures. Hey Gamestop what about Doom Eternal for Switch? Can I have it? If this is true, that’s now 6 games from Bethesda hitting the Switch: 4 console games & 2 phone games. Better support than EA with only 2 games from them. Wasn’t that one indie published by EA? Can you remember which indie game? I haven’t really paid attention to any of the indie games releasing to the Switch as I rarely, if ever, clicked the email’s link to the MNN article talking about it & simply deleted the email. So I got no clue who made or published most of the indie titles. Ah. EA’s 3 to Bethesda’s 6. Still better support but least EA’s… trying…?